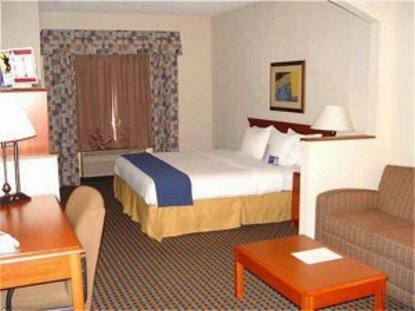 The Holiday Inn Express DALLAS /STEMMONS FWY (I-35 E) is a newly renovated Hotel located in prestigious North Dallas/MARKET CENTER/DOWN TOWN DALLAS. The Holiday Inn Express is 1 mile from Speed Zone Texas/Cowboys Stadium. We are 12 miles from Dallas Fort Worth International Airport (DFW) and 2 miles from Dallas Love Field (DAL). Downtown Dallas, Deep Ellum, West End, lower Greenville Avenue, Northpark Mall and the Dallas Galleria Mall are within 10 miles. When booking now, you have our lowest Internet rate guarantee and you earn Priority Club points for your stay with NO extra fees Our newly renovated hotel and its lavish guest rooms make it a perfect stay for the weary business traveler. Over sized rooms, luxurious sofas, granite tops are great way to unwind. For your dining needs, try famous restaurants in dallas Pappadeaux, Pappasitos, Pappas Brothers, Jason&regs Deli, Red Lobster and Olive Garden. Like the nightlife try Firewater Bar and Grill. Our meeting space is newly renovated and ideal for all types of events for 5-85 people. This hotel is committed to providing accessible facilities under the American Disabilities Act. If your accessibility needs are not met, please contact the Hotel Manager on Duty. Should you require additional information regarding accessible facilities for guests with disabilities, please call 1-800-Holiday (U.S. and Canada) or contact the hotel directly. For the hearing impaired, TDD service is available at 1-800-238-5544 within the U.S. and Canada.